Received this beautiful picture from Bill Strong as well as corrections from John Herriott regarding some mistakes in my original narrative. 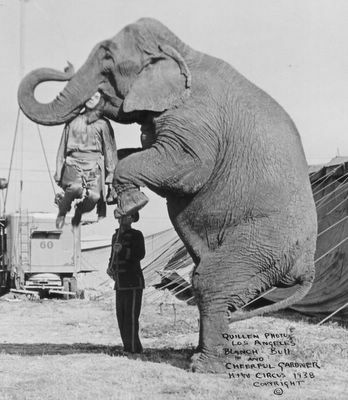 This act was trained by Franz Althoff's brother Adolph who brought it to this country for Charley Baumann to work. He was accompanied by his son Fanzi and future daughter in law Evy who had no background in the circus at all. As it turned out the tiger had an immediate and lasting dislike for Charley so Adolph worked he act most of the first season, his son Franzi was a horse trainer so if fell to Evy's lot to eventually learn how to work the act. 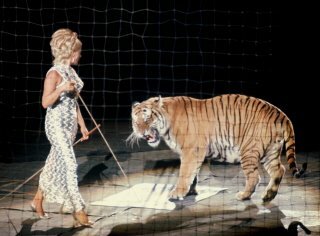 I think this is one of the nicest animal acts I ever saw, trained and originally presented in this country by the great Franz Althoff and later worked by his daughter Evy as seen in these exquisite pictures taken by Eric Beheim in 1970. 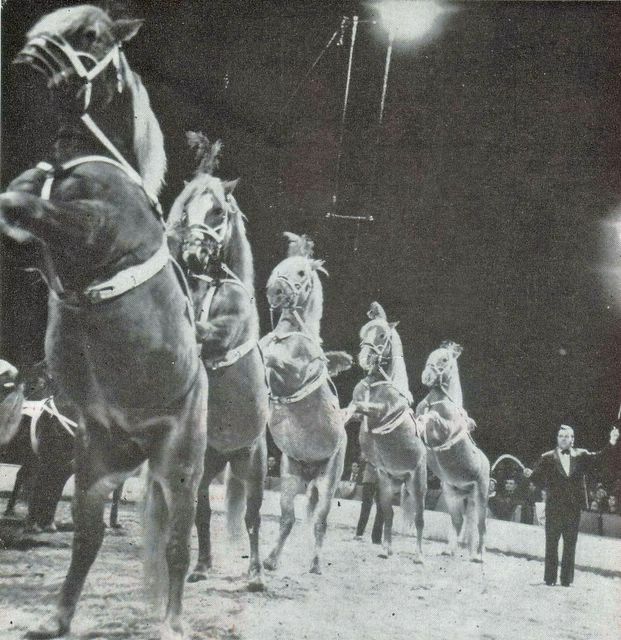 John Ringling North imported the act in 1967, the same year he sold the show. This was a huge tiger and as you can see is using a mat as a reference point rather than a pedistal. I first saw this act in 1968 and as I recall, it worked in Charly Baumann's arena immediately following his act. In fact Charley would remain to assist Miss Althoff. 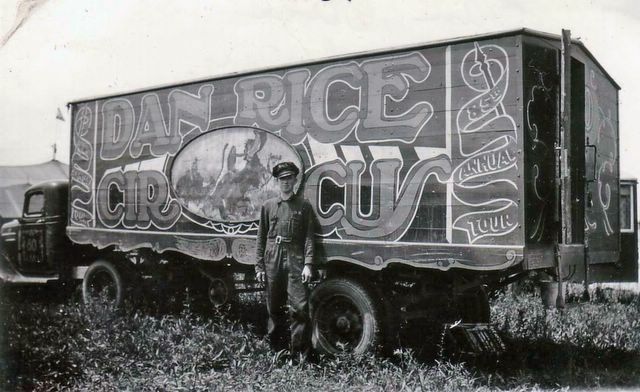 I'm sure you circus music buffs are familiar with the excellent music that came with this act and later taped during several of Merle Evans concerts. 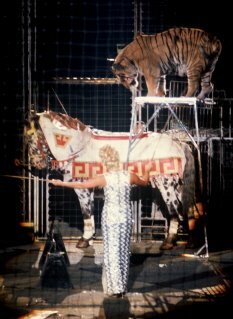 The tiger and horse would circle the arena in tandem, double file with the tiger inside, as well as single waltzes with the tiger in front. I was told that in Europe, when working in a dirt ring, the drill was much more elaborate but after arriving here a lot of it was cut after the horse fell after tripping on the lacing in the rubber matting. 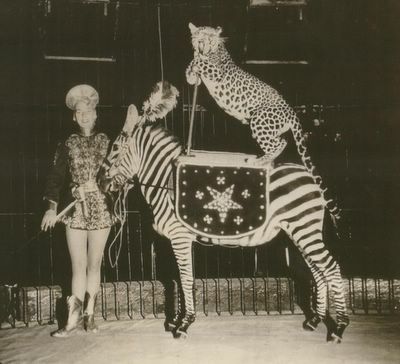 The tiger was so big that when he would step down, the horses knees would actually buckle a bit. 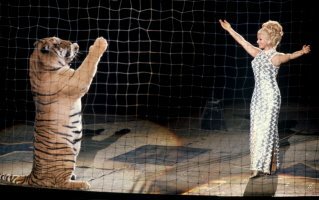 For the finish the horse would galop around the arena and the tiger would vault repeatedly from the ground to it's back, always returning to the mat seen in picture #1 so the distance would be equal for each run. Whenever I am reminded of the sorry state of affairs with the Ken & Nicole Show today, I think of Irvin Feld's glory days when he had Gunther Gebel-Williams, Charley Baumann, Franz Althoff and Wolfgang Holtzmier in his stable of cat trainers. It would appear that Europe was underwhelmed by Circus Busch in 1976 so I relucantly return to a more polular subject. 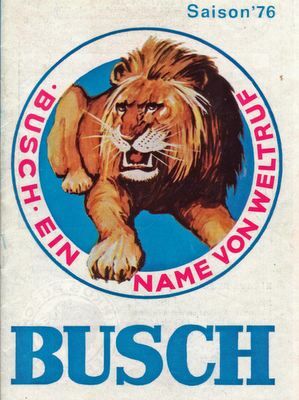 I have quite a few European programs but the text is in German, which of course, I can't read. So I thought it might be interesting to send these pictures out early and see if we get any comments from Europe regarding the show and it's artists. If any particulr interest is shown, I could repeat this every following Sunday. Closing out this eventful week, I thought I'd enclude some pictures of the Riddle Sanctuary in Greenbrier, Arkansas where I retired three of my elephants. I had forgotten what a beautiful specimen "Peggy" is. No excuses, alibis or secrecy at this place, in fact the public is invited in. 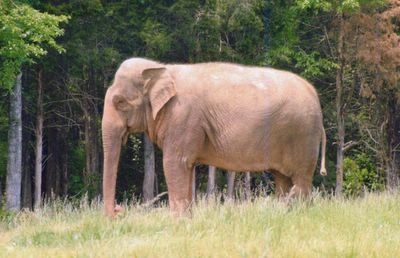 I believe there must be about a dozen elephants there now, both African and Asian, male and female that have provided a successful breeding program. 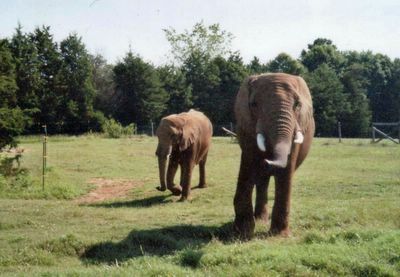 Anybody that might be interested in details on this place check out www.elephantsanctuary.org. "Peggy" out back in the pond. 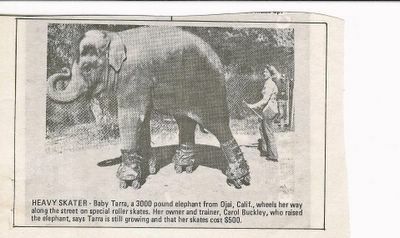 Now this is an elephant that will kick you around if you don't know your business, that's the reason she was given to me years ago. I thought it was imperative that I retire her into the hands of exprienced people. I'm sure a lot of you remember "Amy" from her days with the Big Apple Circus. 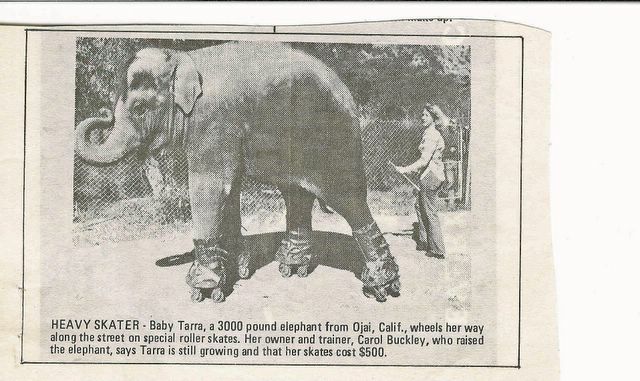 Once Don Covington and I walked her from Lincoln Center down town about twenty blocks to a TV station. She then went up some stairs, thru sliding doors and up a freight elevator to an area where she did the Morning News with Al Roker. As you can see, love is in the air. 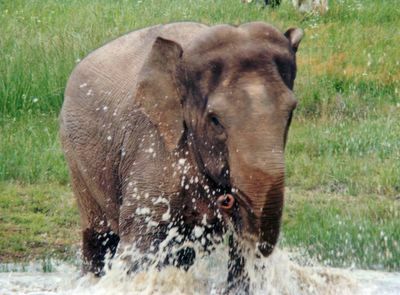 "Amy" is already an expecant mother with a calf due the winter of 2007-08 to add to the Nursery. These next two pictures were taken at the Ionioa, Mich. Fair in the late 1950's showing Gene Holter's fair unit. 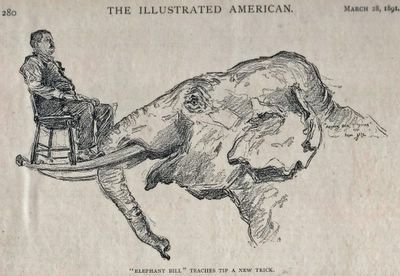 The elephant is "Babe" originally from Gentry Bros. Circus. 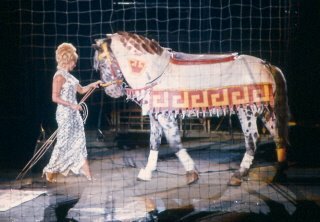 I regarded his sort of stuff with great annoyance at the time, even tho it was only done once each show with volunteers from the audience. 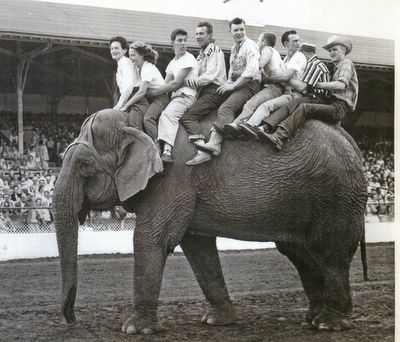 About this same time my father had our elephant act booked with a Barnes-Carruthers Fair Unit that appeared in front of the grandstand usually for the run of the fair. that could be unloaded, exhibited, reloaded and out of town with a minimum of complication. I was delighted to see Wally Ross again. managed to have the audience coerce the town's Mayor, Police Chief and Fire Chief into being the riders in this event, one lap around the track. At the signal one camel took off, another whirled around and headed the opposite direction while the third went over the fence and across the infield with "His Honor", doing that "dance of death" that camels do. I'm sure I have laughed louder and longer in my 71 years but I don't know when it would have been. Within an hour after the show they were loaded and gone on to another fair. 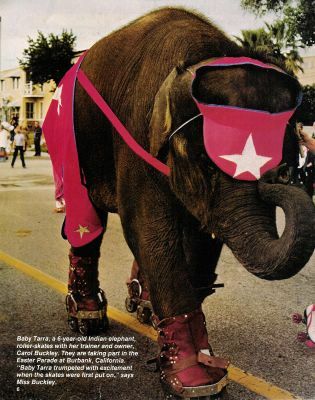 But after elephant rides came in fashion I was as guilty as all the rest. Here am I, ten years later along with Chico's dog "Baron", at the Detroit Shrine date, catching a quick nap between shows before the next ride session. The tell-tale howdahs in the background. The annual three month winter home in Lincoln Center for Big Apple Circus, nestled between the Metropolitan Opera and the New York City Ballet. 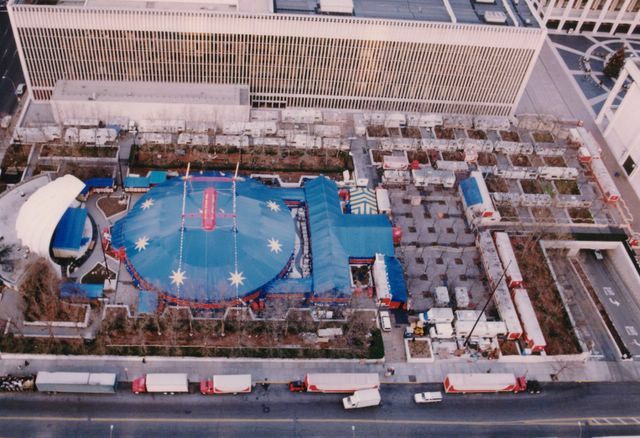 Our trailer is located in the top row at the extrteme left in the "Beverly Hills" section, overlooking Amsterdam Avenue, the first one in and the last one out. Michael Christensen and Jeff Gordon. 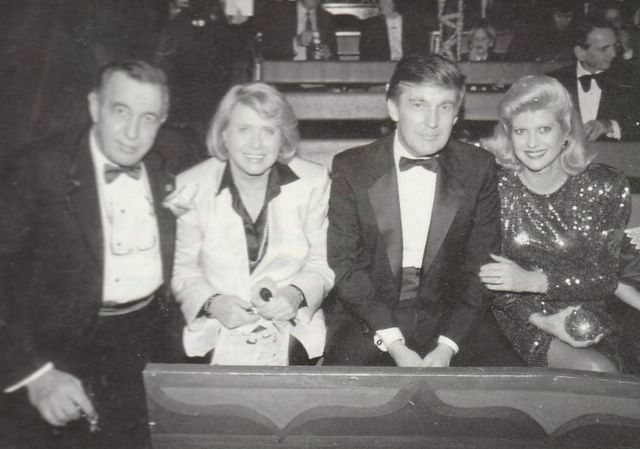 The Big Apple Circus Board Chairman Alan B. Slifka attends the opening night performance at Lincoln Center with columnist Liz Smith and Donald and Ivana Trump. 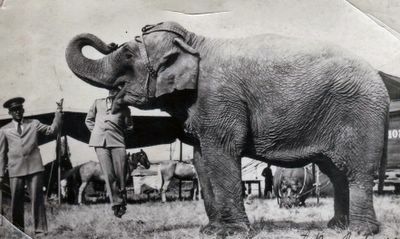 Alonzo Dever, boss elephant man at right. 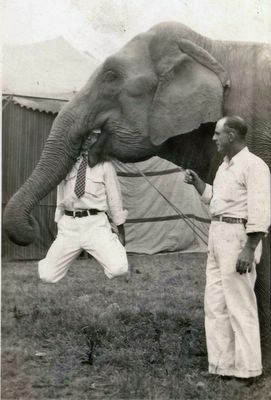 Joe Metcalfe, boss elephant man at left. 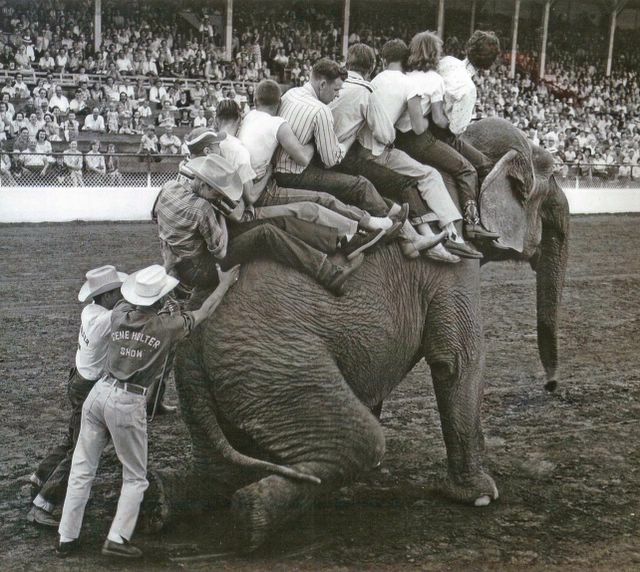 This is more to my liking, I've trained a number of elephants to do a leg carry but this one is puzzling. How does she get into this trick? 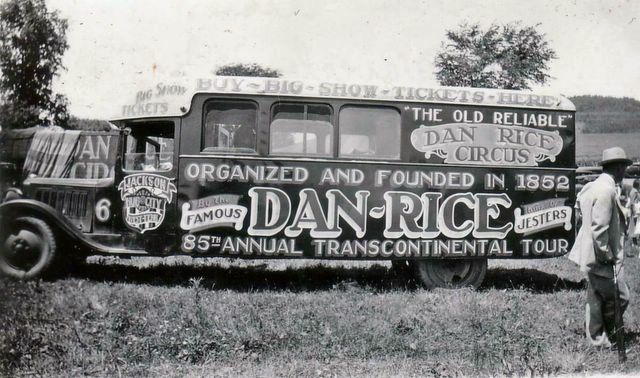 Very interesting comments by David Carlyon regarding Mr. Rice at "Dan Rice Circus 1937 #1", this picture from my collection, whom I find that I resemble more and more as time flies by. I'm embarrassed to say that I know nothing of this show, particularly since this was it's 85th Annual Tour. Says so right on the side of the truck. The name Ray Marsh Bryden comes to mind but I'll toss the ball to someone more knowledgable on this one. 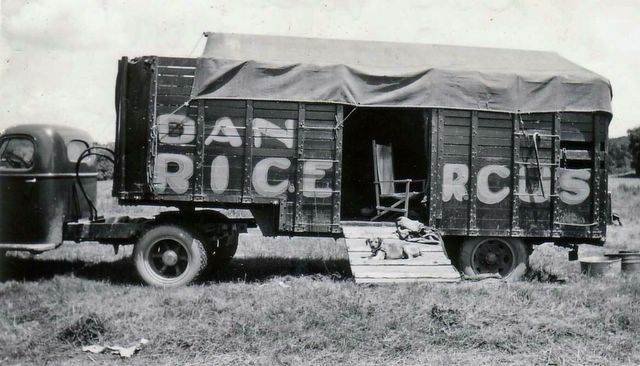 There are a lot of pictures I had to sort out and it seems the titles "Rice Bros. 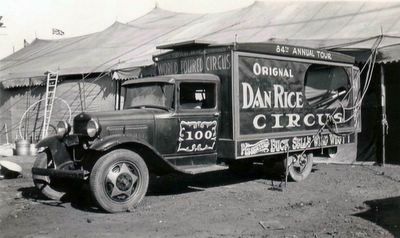 Circus", "Famous Rice Circus" and "Rice Bros. & Allen King Wild Animal Circus" were all used during this time frame and the equipment appears to be about the same. No labor saving devices here, a wheel barrow chassis to move things around and a "Georgia buggy" to pull stakes at night, tied off on top. This truck has a pitched roof, I thought it rather unsual. This band stand must have been added the second season out since this is only it's 84th Annual Tour. No doubt it has an air calliope mounted inside and having just completed a bally down town is about to be backed inside the tent. Notice the name painted on the truck, this would be Bucky Steele's father. I believe these elephants were leased from the Cole Show, if so the two males are "George" and "Barney". 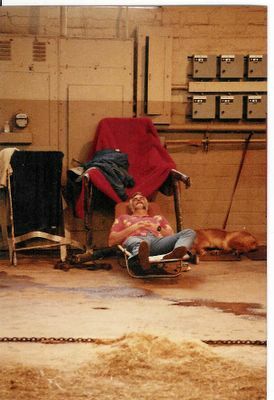 On the back of the picture is written "elephant truck" and we see the Captains chair in the doorway and his dog reclining on the loading ramp. This looks like a former horse truck the show had provided, I can imagine a pretty good ruckus the first time that tarp started flapping over their heads. Looks like all the excitement in Tennessee has settled down. The Officials have deemed the unfortunate event to have been an accident and Winkie is genuinely sorry. Rather than say "Who in Hell is responsible for letting those people set up shop in our State and bring in all these dangerous elephants without first checking out their credentials?" they simply took the safe way out. It appears that Mr. Blais injuries were an accident as well. There is also a blame to be placed on the U.S.D.A. who engeneered this whole fiasco in the first place by yielding to PETA pressure. 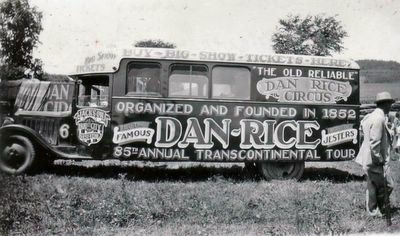 Anyway, it's onward and upward, I came across a set of very interesting 1937 Dan Rice Circus pictures for tomorrows blog. Newman worked as a hand in the P.T. 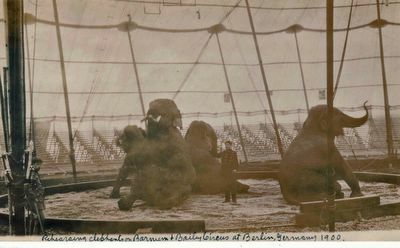 Barnum elephant department 1877 thru 1880 and was Arstingstall's assistant duing the Jumbo years. 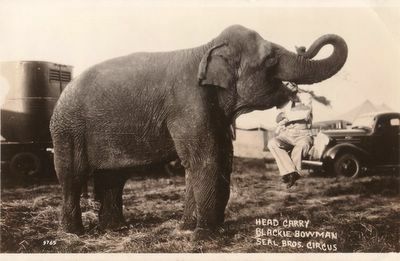 He took over the Barnum & London herd in 1886 after Jumbo's death and was in charge off and on, throughout the Barnum & Bailey European tour 1898 thru 1902. 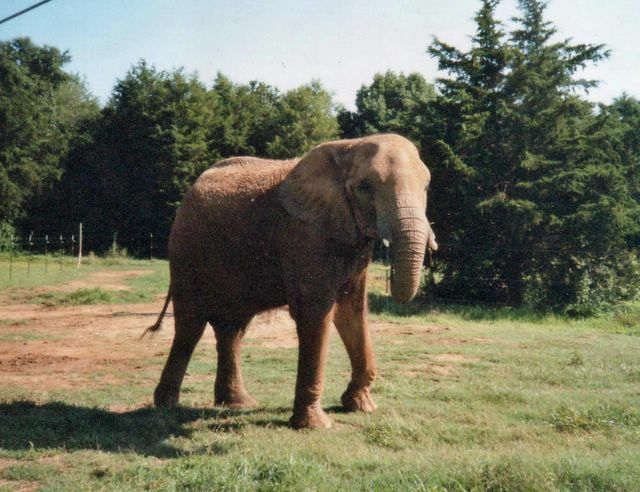 Tusker in the picture is "Fritz". "A rough kitchen chair, which when the circus opens,will have been transformed into a gorgeous throne, is secured without straps on Tip's tusks. 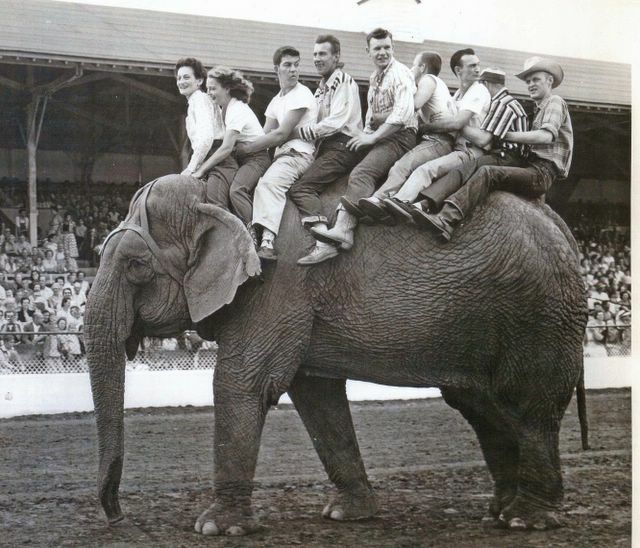 Newman mounts it and the huge elephant walks around the ring bearing his trainer up aloft. Tip seems to take deep interest in the trick". 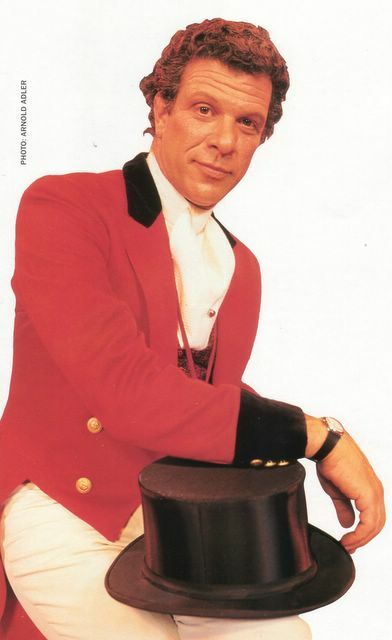 Willy Schumann is probably the greatest equestrian director in the world of the circus. He speaks fluently and can give directions simultaneously in, a dozen different languages. 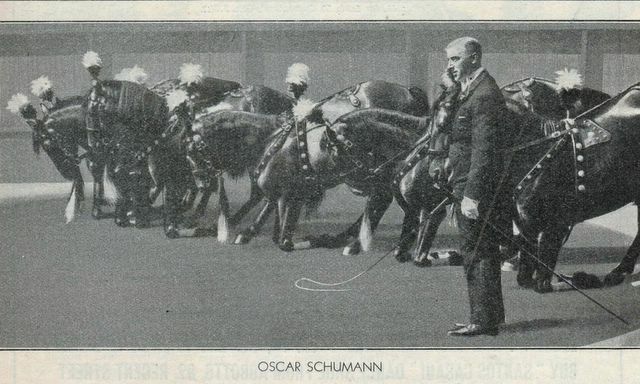 He and his brothers, Ernst and Oscar are famous for their magnificent horses and riding. The youngest member of the family is Ceciele. She is the daughter of Oscar and seventeen years old. Already she has won for herself an enviable reputation as a high school rider. 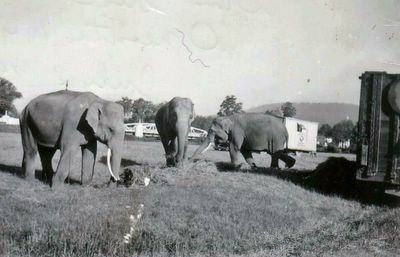 Passionately fond of wild animals, Mathies dreamed of one day becoming a trainer however submitted to his father's wishes that he become a farmer. He found the lure of wild beasts too strong and one day packed his belongings and enlisted as an ordinary keeper with Hagenbeck's Menagerie. His intimate love of animals, coupled with his application to the work, soon secured his promotion. He traveled as an assistant to the famous trainer Sawade all over the world, and was once instrumental in saving the life of his chief when attacked by a tiger. 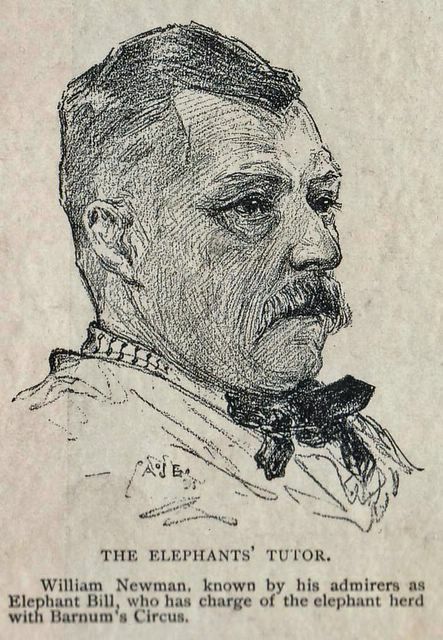 Later he succeeded to Sawade's position. Four ladies and two gentlemen constitute the troupe. Their parents were well know Hungarian riders in some of the most famous European circuses. 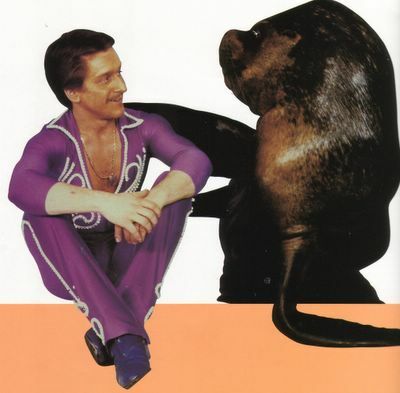 Clarence Riffenach had many strange experiences while traveling in the Far East. In Canton 10,000 Chinese tried to break into the circus without payment and during a fierce storm in Manchuria the big tent was blown down overturning two cages in the menagerie releasing two tigers that with difficulty were finally recaptured. Julio Xifra Diaz de Valesco- to give his full name- was born in Madrid. His father, an engineer, was fond of horses and riding but Julio is the first member of his family to adopt the circus as his profession. He was trained by the famous Canero and the Marquess of Movellan, and is the only living horseman who rides without a bridle, in an attempt to emulate the feats of Simao de Veiga, the famous Portuguese bull-fighter. Once again these inimitable farceurs are at Olympia. 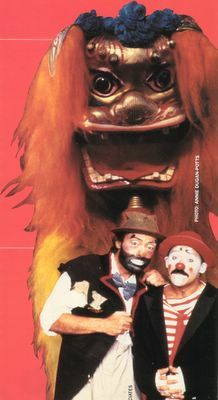 The brothers were born in four different countries and come from a long line of circus folk. 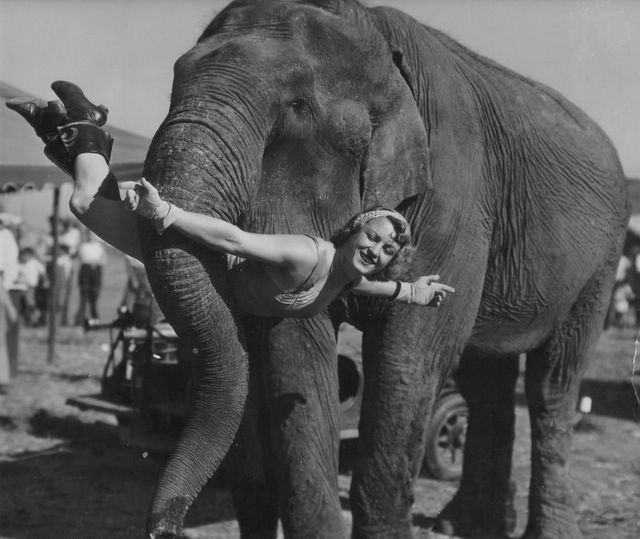 Before adopting the business of making people laugh they were trained by their father in riding acts, trapeze acts and dancing. These equestrians are from South America. They learned their riding on the plains of the Argentine before comiong circus artistes. 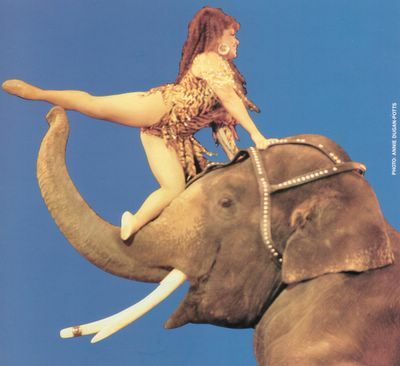 The finishing touches to their artistry were acquired with the famous Ringling, Barnum and Bailey Shows. Trick cycling must run in families. 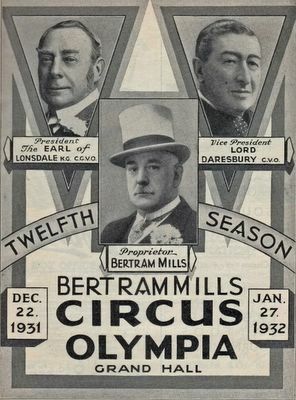 The Klein Family follow on the wheels of Arthur Klein their father, whose troupe of riders was famous in Continental circuses. Motorcycle racing is their favorite recreation. The Germaine Troupe represents two generations. Charles Germaine, the father of the Equestrian trio, still appears in the act and is proud of the ability of of his children due in large measure to his training. 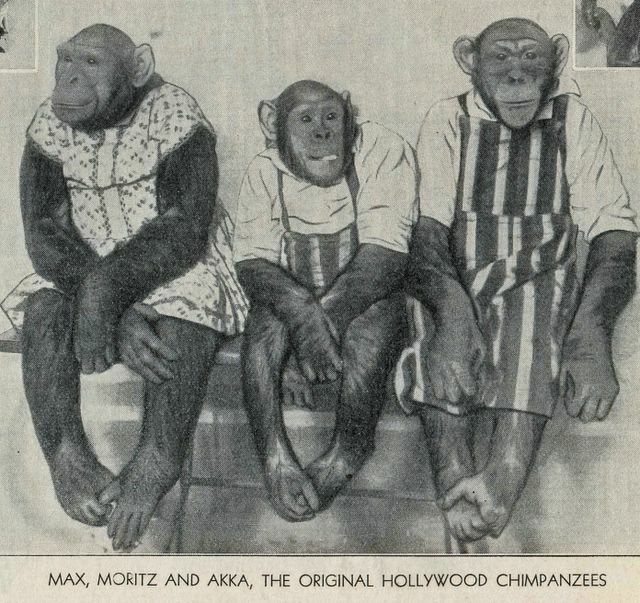 The Original Hollywood Chimpanzees, trained by Castang and Judge, both of whom were born in London. Reuben Castang is the son of a man whose family established themselves as dealers in animals and birds in Leadenhall Market 200 years ago. 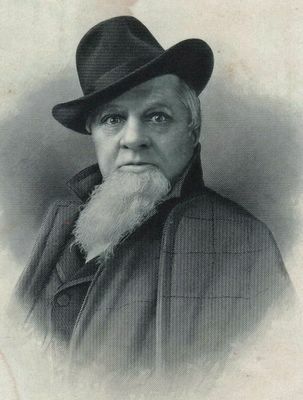 Charles Judge comes of an old circus family. His father was a circus proprietor, his mother was the daughter of one the first great importers of wild animals and his wife is a daughter of "Lord" John Sanger. The "perch act" is one of the most thrilling and dangerous that a circus performer can undertake. Carlos and Julio Olvera, who were born in Mexico, make it even more hazardous than usual. This is their first visit to Europe. An accident caused the formation of this troupe.After nearly 30 years of circus business their father had retired and was living on the revenues of two circuses in Egypt. 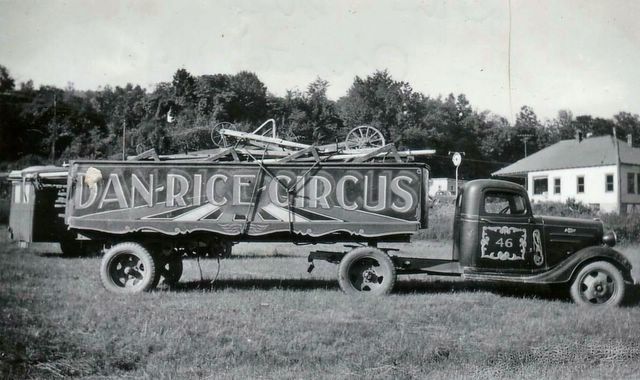 Then the two circuses burned down and the elder Picchiani found himself penniless. 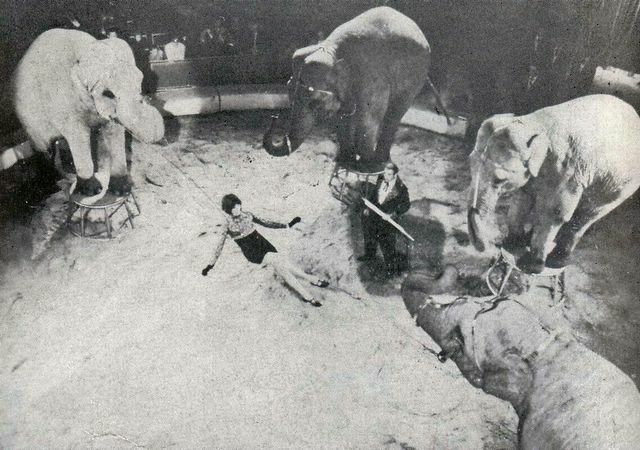 He returned to the sawdust ring and taught his sons and daughters to become acrobats. 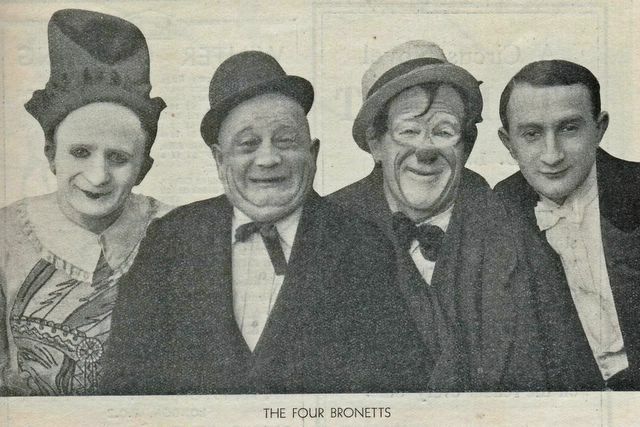 For forty years the troupe of seven sisters and three brothers have performed without change. The ten members of this troupe are nine men and one lady. 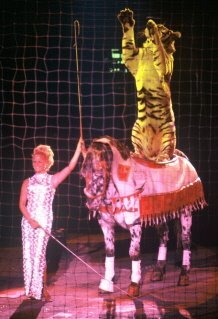 They have toured all over Europe and North America and are one of the rare examples of circus performers not born to the business. Before the troupe's formation, none had been connected with the sawdust ring nor their families before them. The Wallenda's learned their business from their parents, who in turn, were instructed by their own mother and father. Their grandmother was English. 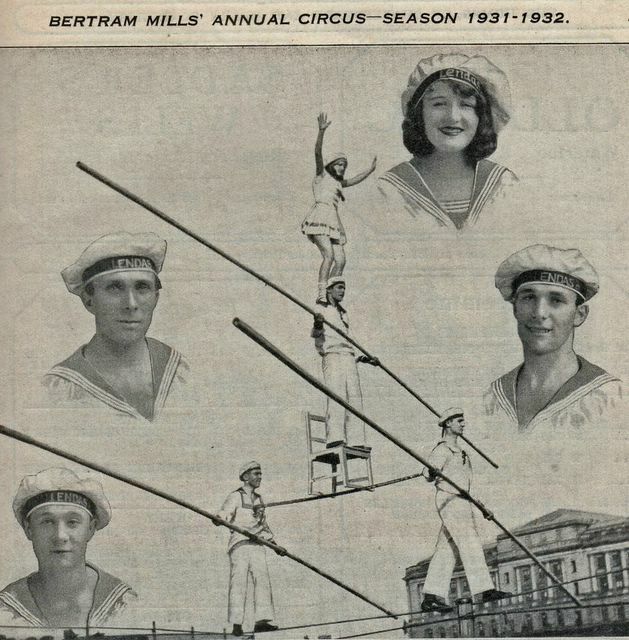 As is usual with circus families, their training started in infancy and the present troupe is already following the same tradition. 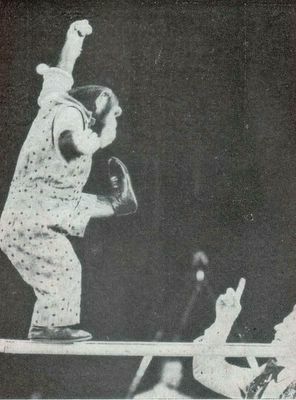 Karl Wallenda has a 4 year old daughter who is already an expert wire walker. Cilly Feindt was born in Berlin but her fame is international. She is rated among the finest women riders of high school horses in the world. This is her first appearance in England. Although only nineteen, she has been a cicus artiste for some years. 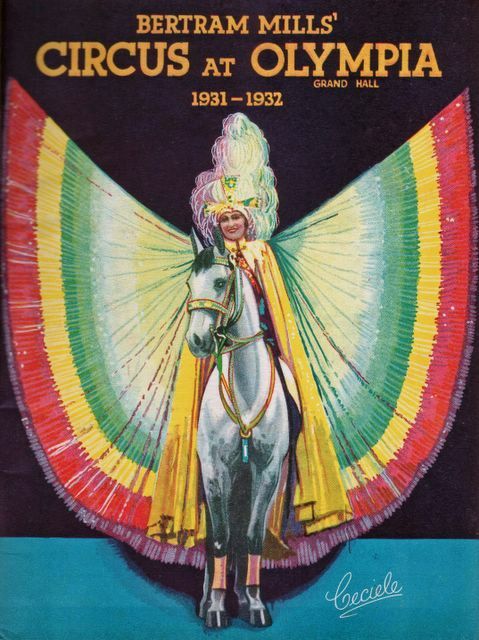 She began as a rider under the tuition of the famous horseman Carl Hess. The Walkmirs are Italians. Their "perch act" was learned in their father's circus, that of Signor Walkmir , all of whose family are circus artistes. Between them they speak four European languages. This is their first appearance in England. Comedy trampoline act. Cosmopolian is the only fitting description of the Cleos, since the members of the troupe represent four nationalities, viz: England, Hungary, Denmark and Austria. Clyde Ingalls, the human encyclopedia about fairs and side shows is again in charge of this aggrregation of indescribable interest. 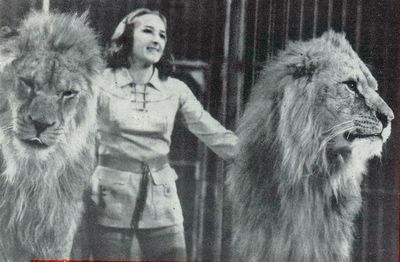 Juba and Joker, the two lion cubs are on view. For the first time in London a Turkish gentleman, Zaro Agha by name, who has just celebrated his 156th birthday and is far and away the oldest man in existence. An embalmed bull whale, weighing 65 tons and reputed to be 200 years old at the time of his capture, is on exhibition. There is also a new Wall of Death, as well as the Congress of Strange People including giants, strong men, midgets, dwarfs, etc.